Luxury Apartment in Puerta del Sol, up to 6 guests. Luxury Apartment in the Puerta del Sol and next to the Plaza Mayor, the Royal Palace and the best museums, theaters and shops of the city, Restaurants, Tapas. Logically well connected and close walking distance to all the sights of Madrid. It has 2 bedrooms, 2 full bathrooms, large living room, kitchen, 3 balconies. Located on the second floor is very bright. The building has two elevators. Fully equipped for your comfort: Air Conditioning and Heating, Movistar TV Smart TV, Football, Formula 1, MotoGP, etc, ADSL Fibre Optic. The apartment has everything needed to accommodate up to 6 guests, bedding, toalllas, dishes, dishwasher, microwave, hair dryers, etc., to make you feel as comfortable as at home. We rented this great apartment of 120 m2 newly refurbished (July 2014), 4m high ceilings, sunny, central and charming and luxury. It's in the street Marques Widower of Pontejos in Puerta del Sol, downtown, within walking distance of the most interesting places in Madrid. It is the perfect place if you are looking for quality accommodation, economical and quiet in the city center, to feel at home. You can walk to most sights of Madrid. The apartment is on the second floor of an elegant building with elevator. The furniture and all the equipment is new, quality and design. It is therefore an apartment with all amenities and is perfect for relaxing in the evening after a long day of sightseeing. * Master suite with king bed, closet and private bathroom, also has a lot charming terrace pedestal with breakfast or coffee, cups, etc. * Room with two beds, cupboard. * Possibility of 2 extra beds. * Can sleep up to 6 guests. * Other Bathroom with shower. * Kitchen with everything you need to cook and eat in the apartment. Includes ceramic hob, oven, microwave with grill, washing machine, coffee / tea kettle and toaster, coffee and assorted utensils. * Three large balconies overlooking the street. * Bed linen (sheets, bedspreads, Nordic covers, quilts, etc. In short, everything you need to feel at home. Guests are alone and your air during the stay, have our phone for anything you need. In spite of being in Puerta del Sol is located in, ideal for rest without noises in the night silent street. Guests can experience the famous nightlife of Madrid from its own center and all amenities. Deposit: The guest must provide a deposit of 200, - € in cash or card. It will be refunded at the end of the stay. Perfect apartment in Puerta del Sol, with all amenities, modern furniture, all brand new, to enjoy strolling through the center of the capital. Next to Plaza Mayor, Royal Palace, Museums All the best stores for shopping, theaters, cinemas, restaurants, Cups & Lids city close at hand. Angel was great at arrival and getting us all set up. checked up on us and booked our cabs to the airport. Central location between the 2 main plaza's ( de sol and Mayor). Apartment feels Spanish and is cozy and comfortable. You are in the center of it all, so, it can get noisy, however, the convenience is a great trade off. Would recommend this apartment and specifically the owner! Perfect home away in city center!! My family of 6 stayed here for 4 nights. They were so kind as to put 2 extra beds in the room with the twins. And they were comfortable extra beds not just cots. Very cozy. Check-in was 4:00 but our flight landed at 7:00 am. Angel met us in the apartment at around 9:00 am and it was ready for us. That was wonderful. Angel couldn't of been more helpful. He showed us around the apartment and gave us a map and highlighted areas of Madrid to see. There was also a complimentary bottle of wine and snacks for us. A nice touch! The apartment was very clean and smelled clean. The kitchen had some coffee, tea, spices, dish soap and nice pots/pan and a dishwasher! There was also washing machine soap and an iron. The shutters on the windows when shut at night kept the rooms very dark - which I love. Some of the other reviews mentioned the noise at night. At times the street did get noisy, so if you are a light sleeper it may wake you up. The street is not one of the main streets. The noise level on other streets may be far worse. And the little bit of noise could not beat the LOCATION! This apt truly is in the center of everything. It was easy to walk to the royal palace and to Retiro Park. The bathrooms were very nice and strong water pressure. With 6 of us, we did have to stagger shower times, which was no problem at all. There is a grocery store close by and a great bakery around the corner!! Angel was very responsive to any messages I sent him before and during our stay and arranged for a taxi back to the airport. It is a 30 euro fixed rate to/from airport. I would definitely recommend this apt to anyone staying in Madrid. And if I ever get back to Madrid will stay here! Thanks for all your hospitality Angel!! Loved the apartment location. Nice apartment. A little noisy at night but not bad. Washing machine did not work and kitchen sink leaked on kitchen floor. But overall great place with lots of room. Bright, airy, spotlessly clean apartment with all necessary amenities for an enjoyable vacation. One street away from Puerta del Sol and Plaza Mayor, Dozens of tapas bars and restaurants as well as fast food venues. Corte Ingles (grocery store) ,several coffee and pastry shops are nearby so you will not go hungry in this part of town. Puerta del Sol is accesible to a Metro station where you can connect to either of the railroad stations that connects you to the rest of the country or to Barajas airport. My family and I had a wonderful time in Madrid. Angel and Jose thought of everything to make our stay comfortable. We did not have any problems. The location was perfect for all our sightseeing in Madrid. Everything was walking distance. It is close to both Plaza Mayor and Puerto del sol. Sometimes the street was noisy but it’s to be expected because of the great location. We will definitely stay there if we visited Madrid in the future. Thanks so much for your stay and everything ! I was very happy with the apartment and it's location. It was very close to Plaza Mayor and a ton of shops, bars and restaurants. The beds were comfortable and the apartment was a good size. The couch and the dining set however were not very comfortable which made it hard to all hang out together. I would have rated it 5 stars except for a felt it was a tad over priced for what it was. I didn't realize there was an extra charge and had my brother and sister in law stay with us 1 night and they charged us an extra 50 euro for it. Which made our stay way more expensive and had I known about the extra charge we probably would have found other accommodations. But for two people, it's reasonably affordable. And they are diferent it depends on number of people. 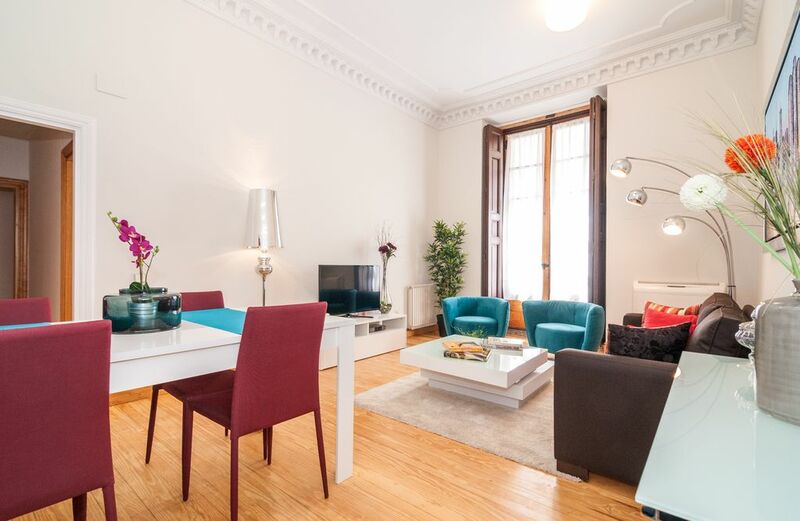 The apartment is located in the heart of Madrid, in the Puerta del Sol, next to the Plaza Mayor, Royal Palace, Museums, best shopping streets of the city and most atmospheric venues in the capital. You can access the entire city to be well connected by metro and buses, also of course Taxis. There are public parking nearby. It is certainly the place to meet and fully enjoy the city of Madrid. El huesped deberá entregar una fianza-deposito de 200,-€ en el Check In, que le sera devuelta una vez finalizada la estancia. ( efectivo ó tarjeta de credito ). Check-IN : Los Check-In realizados más tarde de las 22:00 h, tendrán una tasa adicional de 20,-€, que se pagarán en efectivo en el mismo Check-In.